I have never been and probably never will be a high maintenance kind of chick that requires a lot to survive. We used to camp a ton when I was little and I was always the first one booted from the campers into a tent. The tradition of camping has been such a memorable one that now having children of my own I want them to enjoy the same great experiences I had as well as form those great memories and traditions for our own family. Usually we camp several times a year and of course tons of tailgating whenever possible. I was beyond thrilled to learn about this next product which is perfect for these types of activities and more. The Grub Hub is basically a camp kitchen but in my opinion so much more. 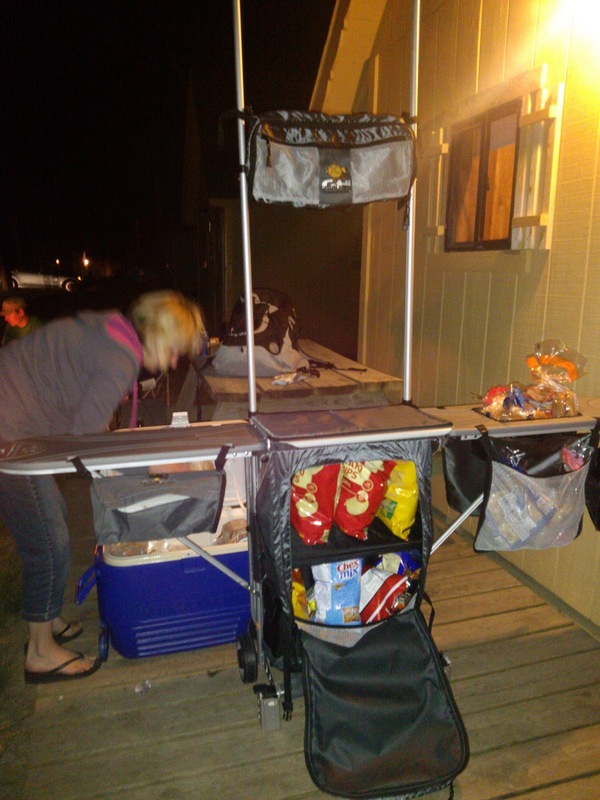 "The Grub Hub® stores and transports all camp kitchen gear then sets up in 3 minutes to provide tables, stove support, lantern support and organization needed for a complete campsite." Because there are tons of compartments and racks, you have room to store everything you need for your camping trip. There are even built in features which make the cleanup just as easy! "All components are engineered for extended outdoor use in all weather conditions." Once the grub hub arrived we of course tossed it together in the living room to check it out. At first try, this can prove to be a bit tricky to toss together even while following directions. However once you've done it once it pops up like nothing and you have a full kitchen setup it seems within seconds. I freaking love this product and felt like the Jones of camping sporting this outside our Amish cabin this past weekend. We had tons of other campers coming over to check out our gadget filled campsite. Its funny because as we were packing and having a discussion around what other items we needed, Chantel said "I think you have everything but the kitchen sink." Amy quickly chimed it, "nope Randi even has that covered as well! " This bad boy has all the prep space you need for cooking or even makes for a nice little buffet line. It keeps everything you need in one spot - paper towel, utensils, trash and storage of anything else you may need. There are compartments everywhere you look and a huge adjustable shelving space underneath. 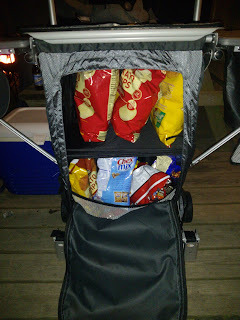 We were able to store all of our snacks underneath not only while camping but to and from without crushing or damaging anything instead of having to pack separate bags which would have only taken up more space. 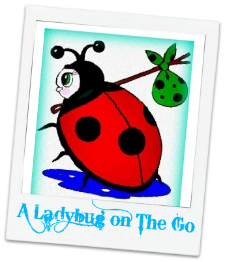 Discount: Enter promo code "LadyBugGH2013" for an $50 off deal on the Grub Hub + a FREE order of Spatulas included with this code too!! Recommendation: This is going to last a long time and is at a great price for such an awesome investment! If you tailgate a lot this is definitely something worthwhile to purchase for this purpose as well! Giveaway: Grub Hub USA is going to give one of A Lucky Ladybug's very lucky readers a Grub Hub® Camp Kitchen - Mesa of their own! I've never been camping with my family (husband and kids), but I grew up camping, and I loved it. This seems like the most perfect tool for it! My husband's a great cook so this would make for fabulous camping! I would love to win this giveaway for my husband to use at tailgating. he has done so much for my and my kids. I couldn't go out and buy this for him because he would say, "I don't need anything from you" I would love to say I won this for him and besides if I went out and bought it, it would be with his money. I want it to be a real gift from me and of course I will tell him I won it if I did. I would love to win this "complete campsite" for my son who absolutely loves to camp out in the woods. He has a few items for camping but nothing like this. I've never seen something like this and know he would be so pleased to have one. If I win this, we are using it for deer hunting camp! I would use this for camping! I would love to win this for my hubby! It'd be great for when he's camping & fishing! And I'm sure he'd find a few football games to use it at for tailgating. I would love to win this giveaway because I am a HUGE Baltimore Ravens fan and I am a season ticket holder and my friends and I tailgate at every home game. This would be so awesome to have!!! This would just add to the fun!!! I would love to win this for my family. We go camping a lot and this would be great to have. Amy W.
I would love to win because as a family of six we camp a lot for our vacations and this would be so wonderful for me to have when cooking and cleaning up! I would like to have this camping kitchen set to have as backup to use in case of power failures do to storms or zombie attacks. I would love to have this for a couple of reasons. It would be really nice to have for camping, a good way to stay organized and make things easier. Also, it would be great for when we have to deal with hurricanes and tropical storms. I live on the Gulf Coast, so this is a common problem for us. Thank you! This would be great for us to take to camp and the beach. And when not doing that we can use it down below by our huge fire pit. I'd love to win this for my daughter and her family. They go camping all the time and this would be great for them. 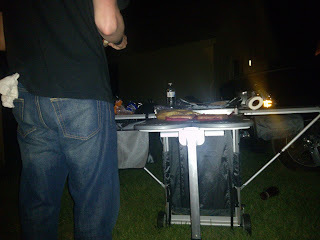 We love to go camping and it always seems like our table is always full of cooking supplies. This would be so handy to have so that everything is right there where you need it, where you are cooking, so that the table is empty so you can sit down and enjoy what you have just worked so hard to cook. We go camping every year for the 4th, plus a camp-out family reunion in the fall, and this would make it super convenient to keep everything organized!! My daughters and my youngest son were all scouts. 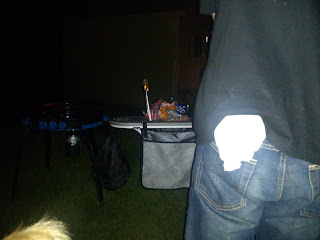 So, camping is something we do a lot of. I would love to be able to add this to our supplies. I can envision contest between the kids over best camp kitchen setups and best meals cooked! I see an "Iron Chef" camp cookoff in our future!! i would like to win this cause my hubby is a bbq finatic and i will get major brownie points if i won this!! We love primitive camping and oh boy is this ideal for that! I love that I can take this anywhere and make good use of it! So much storage and a breeze to haul! Thanks so much! This is a fantastic design. I don't enjoy cooking when we're camping because I feel so disorganized. I think this might help solve the problem. My family and I love to camp on the rivers sand bar and this would be great to take along. I would love to have this because we always wanted a place to grill out and finally bought a house, but then bad neighbors moved in next door. They finally moved out and now we can have grill parties with our family. This would be a perfect Christmas gift for my daughter and her husband, for use during all of the camping trips they take. How convenient! I have an extremely large extended family. We all love to camp and fish. This would be perfect for an outing at the lake or at my grandson's private ponds. I would love to have this for camping which is quite obvious but also I think it would be great to complement my emergency supplies. I am just starting to build my emergency supply items and this would be a great addition. I can definitely see using this while away camping or tailgating, but I think I would use it at home as an outdoor kitchen for canning! Bet this would make prep work easy. I would love to win this giveaway firstly because my family loves camping and road trips. This would make our already good times that much more enjoyable. Secondly, we live in an area often affected by hurricanes. This Camp Kitchen would be such a welcome help for those times when our power is out for from a day to up to weeks. My whole neighborhood would love that! Our family really enjoys camping! I would love to use this when we go camping in the summer and fall because I love to cook and it opens up my options immensely of food I could prepare!! I would love to win this to take camping with us in the summer. But to also take with us for tailgating at the races. It would be perfect for both. I would love to win this to take my grandkids camping with. They love going but it is hard to keep everything organized. This all in one would be awesome. We go camping often in the summer, and this would be just perfect for our cookouts. I would just love this camping set to use.My husband and I go rough camping in a small pop-up camper and don't have anything this nice. I would like to win this giveaway because this prize looks very useful!